New Year, New Lid! Campus recycling is now mixed! Have you noticed anything different about your favorite campus waste station? Recycling at the Medford/Somerville campus is now mixed! Boston will be transitioned in March 2017 and Grafton will make the switch in Summer 2017. Recycling on the Medford/Somerville campus is now MIXED! Mixed recycling means all the materials that you currently recycle will remain the same but will not need to be separated. All paper, cardboard, plastics, glass, and metal can be mixed together in any blue bins with new UFO-shaped lids! 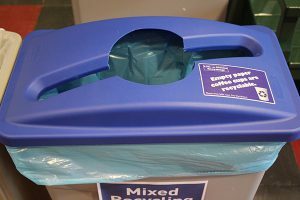 We will keep this blog updated regularly with new information about mixed recycling. You can subscribe to regular mixed recycling email updates here. Wipe out messy food containers. If you’re on the SMFA campus, you can expect to see this same type of waste station starting next week. If you’re on the Boston campus, you will be transitioned in March 2017. The Grafton campus recycling system will be updated during the summer months. The new UFO-shaped mixed recycling lids allow you to dispose of items in a variety of shapes (e.g. bottles and cardboard). Change is hard, but there is no need to panic! Mixed recycling is simple and easy. New mixed recycling stations provide the campus community with two primary options: recycle or landfill (along with existing composting for food waste in many locations). Trash bins are labeled with a white “Landfill” label to help remind the campus community that the trash we discard ultimately ends up in a landfill somewhere. The blue “Mixed Recycling” label indicates that all recyclables can be mixed in one bin: paper and cardboard, plastics, glass, and metal. When in doubt, please recycle! Making the move to mixed recycling supports Tufts’ larger plan to improve solid waste and recycling efforts in line with the President’s Campus Sustainability Council’s goal of reducing total waste by 3% per year. Every Tufts community member is asked and expected to help the university meet its waste goals by educating themselves about their campus’s move to mixed recycling. Read more about the President’s Sustainability Council goals to reduce waste here. What happened to the waste station next to my office? Waste stations have been transitioned to mixed recycling, meaning there are now only two bins at the waste station: trash and recycling. Your original central waste station may have been moved to another area on your floor during the transition, however, please do not move any waste stations. As long as you use your desk-side trash buddy, you will be able to bring your trash and recycling to a central waste station located on your floor of the building. If you have concerns, please contact recycle@tufts.edu. What does “Landfill” mean?A landfill is a facility where solid waste is taken after you throw it into the trash bin. Landfills are engineered to comply with federal regulations and keep waste dry and away from groundwater sources. Landfills are designed to bury trash — they do not help it break down at a faster rate. This means that items you send to a landfill can stay there for hundreds of years, depending on the materials. As stated in the 2013 Campus Sustainability Council Report, Tufts’ overall vision for waste is a cradle-to-cradle economy, meaning that the campus community will consider the lifecycle cost of products before purchasing them. By labeling bins with the word “Landfill” we hope to remind people about where their waste goes after it is thrown away. What goes in the “Mixed Recycling” bin? What goes in the “Landfill” bin? When you take the time to consider what goes in recycling versus trash, you find that most of your waste really can be recycled! For a list of accepted items, please visit the Facilities Services – Recycling & Waste Management website. We also recommend watching the video below, which explains how to recycle under the new system. Still have questions? Please contact Facilities Services at recycle@tufts.edu.